America’s labor movement urges Trump to stop backing powerful corporations and start supporting working people. The Janus case is a well-funded and blatantly political plot to use the highest court in the land to further rig the economic rules against everyday working people. The billionaire CEOs and corporate interests behind this case, and the politicians who do their bidding, have teamed up to strike at our freedom to come together in strong unions. The people behind this case simply do not believe we should have the same freedoms they do: to negotiate a fair return on our work. Working people are the solution, not the problem. All across our country, we need to raise our voices for better pay and benefits and quality public services, not find ourselves gagged by billionaires. Our communities need rising pay, not inequality. Inequality in America is at a record high. Taking away our freedoms to speak and assemble will only make it harder for us to win broadly shared prosperity. “Arguing against our freedoms at work is not what working people expect of our government. 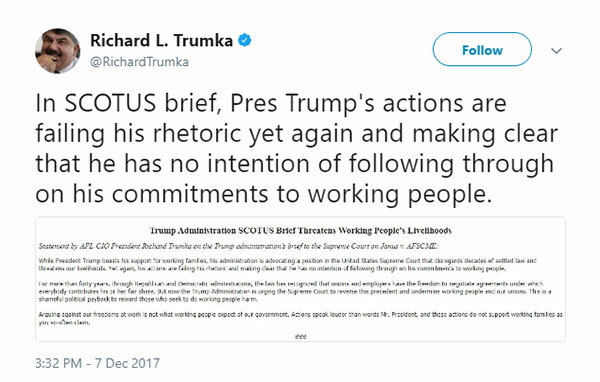 Actions speak louder than words, Mr. President, and these actions do not support working families as you so often claim,” said AFL-CIO President Richard Trumka. 5,000: That’s the number of jobs that will be created to provide quality public services in Los Angeles by 2018 by the Fix LA coalition of labor unions, communication organizations and the city government. Save jobs! Stop the GOP tax plan!